I guess you could call this one ‘second in a series’. Somewhere around the millionth stitch of the black and grey skull I began fantasising about all the delicious juicy colours in my bag of threads. Being still Death’s head-obsessed, the Mexican candy skull was an easy choice. Basically I approached this one in exactly the same one as the first; found the image, traced it onto graph paper, this time more consciously thinking about the size I wanted the finished cushion to be (bigger), then coloured the pattern. And so to work…MUCH quicker to complete this time because I was a stitching demon at this point, a woman possessed. Started actually before I even finished the black and grey, COULD NOT WAIT. Again worked on white aida. I know, I know…why when I was going to fill all the background in black? But my idea for this piece was to make it more folky style in homage to Mexican folk art, and I liked the way the white poked through in this way. Plus I also had this masochistic ideal which (in my head) dictated that to produce some kind of intricate image in cross stitch but then just use coloured fabric to provide the background seemed like cheating or something I guess? I just love great swathes of stitched fabric really. And I love doing it too, so that’s cool. Actually I’ve realised as I’ve gone along that when I’ve done all the really eye-blinding counted main image work, it’s actually a relief to be able to mindless stitch in the same colour without having to use a pattern, with one eye on the TV. OOO! I forgot, halfway through the black and grey my needlework guru (mum) gives me a FANNY FRAME. Yup, you heard me. This, dear reader, is the absolute balls. So after a little while getting my runt left hand to know what to do, I can now stitch away with both hands without having to gnarl my hoop-holding hand into a wizened claw from gripping it to the death. I love it, so brilliant, and much faster. So the black background this time. Despite my posturing earlier and being all ‘oh not stitching the background is cheating’, when it got to doing it I had a little conflict with myself about my commitment to my high ideals or whatever, versus boredom for a minute. Then this awesome little book my guru gave me came to the rescue and I decided to do the back in a really simple blackwork stitch which covered the ground much quicker, and gave it the nice folksy feel I was after. Took me 5 months this time. Whizz. Will post when it’s totally done in all its calavera glory. 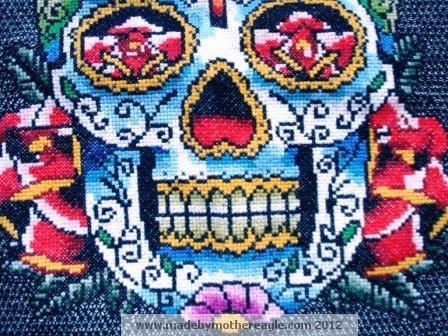 I came across your site when I was looking for cross stitch patterns, and I want to say, this is f’amazing! 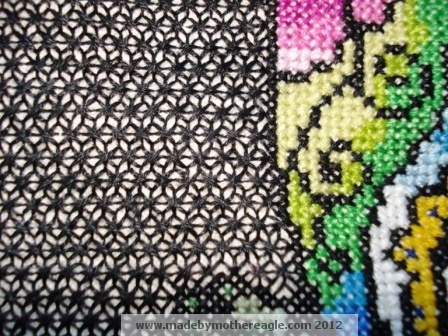 When I looked at the larger picture I thought it had been done on a dark fabric, but when I saw that it was all blackwork, I was shocked. That is one awesome piece. Hey, easy on! Blackwork’s perfectly legit! 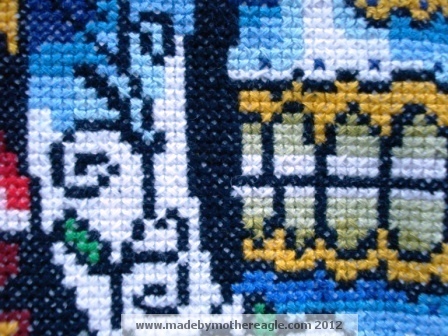 Love this, it’s gorgeous, even stitch goddesses get bored, what’s so special about x stitch, anyway? 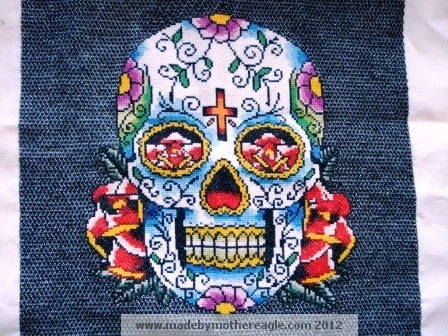 I’ve never been crazy about the “one-stitch-for-all-occasions” approach to embroidery. DOES look properly done, is what I’m trying to say.